• How Is Vitamin D Helpful? When the level of vitamin D becomes too low in your body and affects your bone, it is known as vitamin D deficiency. Vitamin D actually functions as a hormone, so it is called pro-hormone, and all the cells in your body have a receptor for it. To understand the effects of vitamin D deficiency, we must first know the role played by this vitamin in maintaining our health. How Is Vitamin D Helpful? Vitamin D is a fat-soluble vitamin, which is required for the regulation of minerals like calcium and phosphorus in the body. It is also essential to maintain proper bone structure, as it helps in the absorption of calcium from the food in the intestines. If not, the calcium in our diet will be excreted through the kidneys. Recent researches show its role in maintaining the nervous, muscle, and immune systems also. It also regulates cell growth and helps in cell-to-cell communication. The hormonally active form of vitamin D (calcitriol) has shown to slow the growth and development of new blood vessels in cancerous tissues. Thus it reduces the progression of cancer by increasing the rate of death of cancer cells and by preventing cell proliferation. It influences more than 200 human genes. Recent researches have also associated the deficiency of this vitamin to increase the risk of hypertension, multiple sclerosis, cardiovascular disease, autism, asthma, and many other diseases. Lately, there is mounting evidence suggesting that pregnant women are at a higher risk of pre-eclampsia and premature labor if their vitamin D level is not optimum. Our body cannot create other nutrients and vitamins, but our body can synthesize vitamin D on exposure to the sun. When the parts of your body are exposed to the sun, your skin makes vitamin D from cholesterol. I have osteoporosis. Will I be able to conceive? White patches seen on cheeks of 9 month old boy. What could it be due to? Vegetarian sources - Cheese, mushroom, orange, tofu, soy chunks, and fortified cereals. Non-vegetarian sources - Fatty fish like salmon, tuna, and mackerel, eggs, meat, beef liver, etc. If your serum vitamin D level is less than 20 ng/mL, then you are at risk of developing vitamin D deficiency, and serum levels below 12 ng/mL indicate a deficiency. Scarcity occurs when you do not consume enough vitamin D or if your body is not able to absorb and metabolize the consumed vitamin. If you spend a lot of time indoors, you miss out on the sun rays. People living in a higher altitude have less sun exposure. Pollutants absorb some of the sun’s ray, so people living in polluted areas get less sun exposure. Indiscriminate use of sunscreen lotions. The skin of darker people needs more sunlight exposure to synthesize vitamin D.
Consuming food that lacks in vitamins. In obese people, the excess body fat affects vitamin D absorption. The ability to absorb vitamin D decreases as the person ages. People suffering from malabsorption syndrome. Women who are pregnant or breastfeeding are at risk, as they have to fulfill the nutritional demands of the growing baby. Breastfed infants are also at risk as human milk is low in vitamin D.
Often catching a cold and flu. Breast, colon, and prostate cancers. Vitamin D is said to be necessary for calcium absorption, hence its deficiency causes impaired calcium absorption which results in many bone disorders. The softening and weakening of bones in children is called rickets. Calcium and phosphate are required for the healthy growth and mineralization of bones, and vitamin D is needed to regulate this calcium and phosphate balance. A lack of mineralization of the growth plate in children causes rickets. This mineralization defect can becalcipenic(hypocalcemic) orphosphopenic(hypophosphatemic) rickets. As vitamin D helps in the absorption of calcium from the gut, and vitamin D deficiency is the most prevalent cause of rickets than isolated calcium or phosphate deficiency. Itcauses delayed growth, pain in the spine, pelvis, legs, and back, muscle weakness, bowed legs (knock knee), breastbone projection, and thickening of wrists and ankle bones. Children with long-standing vitamin D deficiency can cause an abnormally curved spine, skeletal deformities, dental defects, impaired growth, and seizures. The softening of bones in adults or children due to problems with bone formation or the bone-building process causes osteomalacia. The most common cause of osteomalacia is vitamin D deficiency. Thesoft weight-bearing bones can get bowed during growth. As the condition progresses, people experience bone pain and muscle weakness. Pain is commonly felt in the lower back, pelvis, hips, legs, and ribs. Osteoporosis is a bone disorder that reduces the bone density making it more susceptible to fracture. Sometimes the bones become so brittle that mild forces like bending or coughing can cause fractures. Patients with osteoporosis have back pain due to a fracture or collapsed vertebra, loss of height over time, stooped posture, and frequent bone fracture. A 25-hydroxy vitamin D blood test measures the levels of vitamin D in your body. The normal range is 20 to 50 ng/mL. 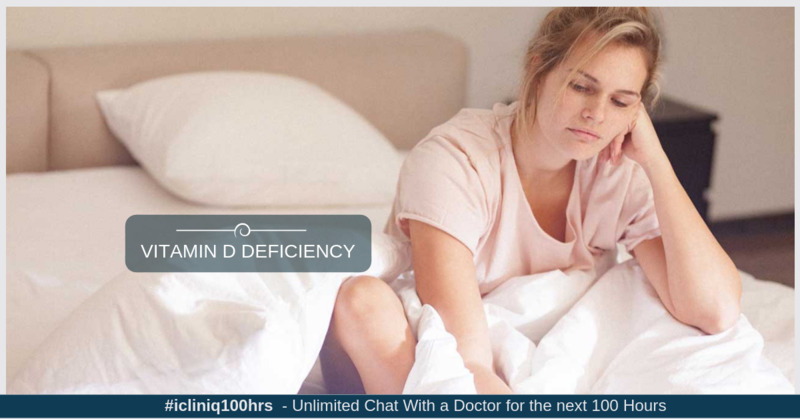 Anything less than 12 ng/mL indicates vitamin D deficiency. Consuming foods that are rich in vitamin D, like fish, meat, eggs, cheese, etc. You can also take foods that are fortified with vitamin D.
Spending a little more time outdoors, as this will increase your sun exposure. Try to spend a minimum of 15 to 20 minutes, 3 to 4 times a week. So, make sure that you get enough vitamin D from your diet, if not, then you can use supplements after consulting your doctor. If you fall under the high-risk category, it is better to check your vitamin D levels regularly, as its deficiency causes many chronic bone disorders. To lead a healthy life, do some physical activity daily and eat healthily! Do you have a question on Osteoporosis or Calcium Deficiency?